Easily removes water behind side view mirrors, trim, wheels, etc! Forget waiting for your car to dry off, use the Metro Vacuums Blaster SideKick Blower to remove water from the surface quickly and easily! 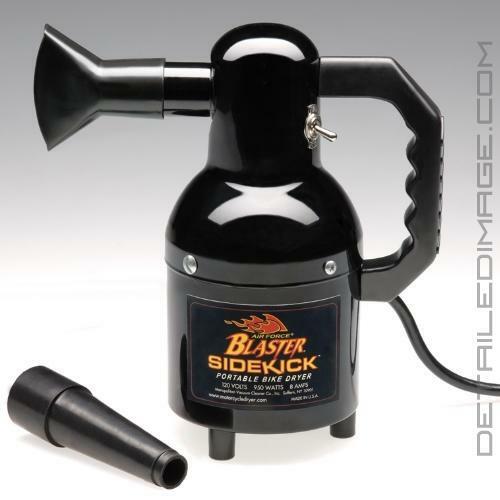 The Metro Vacuums Blaster SideKick Blower is a compact, handheld dryer that will allow you to dry off your vehicle with ease. Water will often hide in cracks and crevices of your vehicle and drip out causing streaks and water spots when you least expect it. Use it to remove water behind side view mirrors, trim, wheels, lug nuts, rubber moldings and so much more! This blower will help you remove this water and dry off your entire vehicle within minutes. 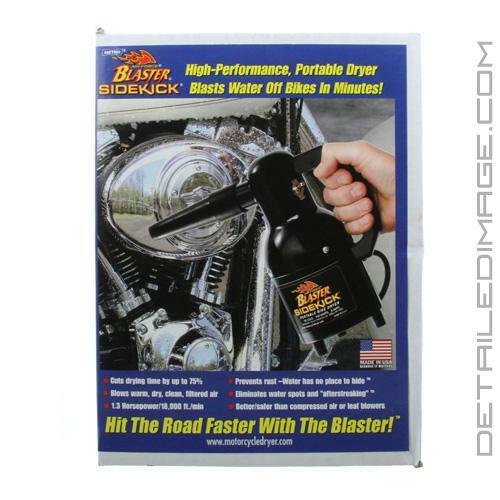 The Blaster SideKick allows you to dry your vehicle with warm, dry, clean, filtered air, which eliminates any direct contact with the paint. That means you will not even need to use a towel and risk adding swirls into your paint. No matter how nice your drying towel is there is still friction that can create swirls, this blower totally eliminates the possibility of adding swirls. This blower only weighs just over three pounds, making it the perfect travel companion. Simply throw it in your trunk or saddle bag and be on your way. 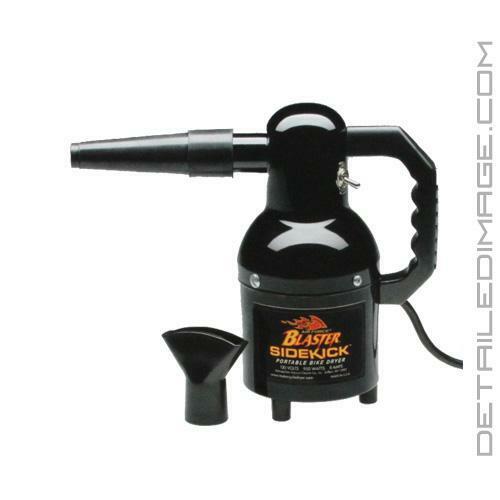 The Blaster Sidekick runs on a 1.3 horsepower motor (18,000ft./min) and includes a 14" grounded heavy duty power cord. It includes heavy-duty, rubber blower nozzle and air flare tool. The blower nozzle is great for tight spaces while the air flare nozzle is great for removing large amounts of water. Another plus is this machine is constructed of all steel directly here in the USA with a 1-year warranty through the manufacturer. Pick up the Metro Vacuums Blaster SideKick Blower today and blast away water spots! If you are interested in this Sidekick Blower, you may also be enjoy the Metro Vacuums Master Blaster Car Dryer and the Metro Vacuums Blaster SideKick Blower! I highly recommend this tool for any detailing enthusiast or professional who is seeking a quick and easy way to eliminate those annoying water spots from water in all of the hard to reach places. The sidekick is so small and convenient, it is much less cumbersome to use than a traditional leaf blower, and (in my opinion) it works better too! It is awesome. Saves time drying the vehicle and you can polish the car faster because you don't have to worry about water dripping. Works great on motorcycles too. Love this little machine! Its compact size makes it incredibly easy to store and it'd little 1.3HP really does a great job pushing water of . I've never had windows look so good! A sealed car plus the Metro Sidekick is the perfect combo! I will buy another guaranteed! Great product! Compact to fit in my detailing cupboard, yet more than powerful enough. Also, much quieter than anticipated. I was able to use this at night with my kids sleeping right above the garage and they never woke up. Added bonus: lowest price found so far. Almost half of what Griot's sells it for.